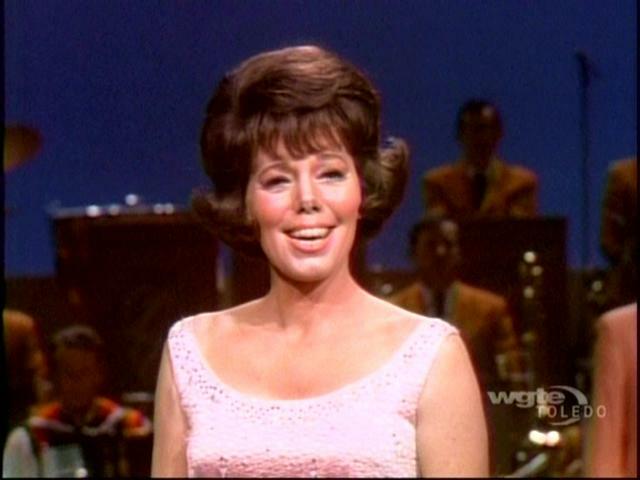 Natalie Nevins was an attractive and popular singer and flutist with the Lawrence Welk Show from 1965 to 1970. Nevins graduated from Little Flower High School in Hunting Park, earned a bachelor's degree in music from Chestnut Hill College in 1947, and took graduate courses in music and drama at the University of Pennsylvania. She studied opera in New York and later in Hollywood. She also learned to play the flute and the piano. In 1950, she was the star of a weekly program on WCAU-TV, Notes From Natalie, singing popular tunes to opera arias. In 1952, she met Ed Sullivan at a benefit in Philadelphia, and he asked her to appear on his show. After moving to the West Coast, Miss Nevins appeared on The Joey Bishop Show and other variety shows, and sang in nightclubs in Reno, Nev., and Las Vegas. In 1965 she recorded an album, Natalie Nevins Sings 'I Believe' and Other Great Inspirational Songs. She told a reporter that Welk hired her after she sang to him over the phone at the suggestion of her doctor, whom she saw for a cold. Welk was also a patient of the doctor's. 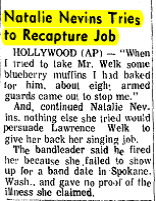 Sadly, Nevins was fired by Welk, a consummate task master, in 1970 for missing a concert appearance in Spokane, WA. Nevins tried to make up for it by baking blueberry muffins for Lawrence Welk and the cast, but could not get past security guards. Rumor has it that Welk preferred German Chocolate Cake. Nevins passed away in August 2010 at age 85 from complications due to hip surgery.